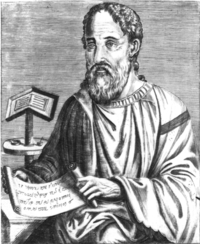 Eusebius of Caesarea (c. AD 263 – 339) also called Eusebius Pamphili, was a Roman historian, exegete and Christian polemicist. He became the Bishop of Caesarea in Palestine about the year 314. Together with Pamphilus, he was a scholar of the Biblical canon. He wrote Demonstrations of the Gospel, Preparations for the Gospel, and On Discrepancies between the Gospels, studies of the Biblical text. As "Father of Church History" he produced the Ecclesiastical History, On the Life of Pamphilus, the Chronicle and On the Martyrs. “May I be an enemy to no one and the friend of what abides eternally. grief stricken and give them comforting words. May I habituate myself to be gentle, and never angry with others because of circumstances. May I never discuss the wicked or what they have done, but know good people and follow in their footsteps. “May I gain no victory that harms me or my opponent. May I reconcile friends who are mad at each other. May I, insofar as I can, give all necessary help to my friends and to all who are in need. May I never fail a friend in trouble.